This year marks the 35th anniversary of University of Macau (UM). 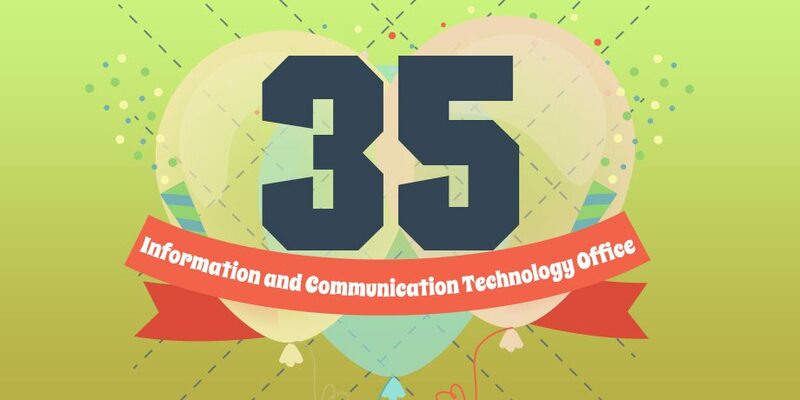 As an integral part of the University, ICTO is proud to chart the IT infrastructure and services development and its achievements in the past 35 years on this happy occasion. 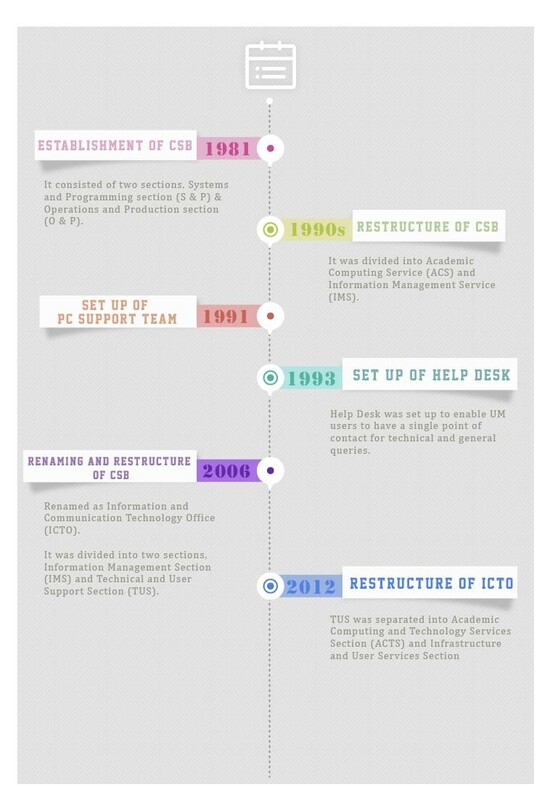 Information and Communication Technology Office (ICTO) was founded in February 1981 with 7 staff members. It was then named Computer Service Bureau (CSB). To keep pace with the energetic and rapid development of the University towards the goal of a world-class educational institution, ICTO had undergone several rounds of changes in its organisational structure and expanded its scope of service a few times since its inception. These changes are to make sure good and quality IT services are rendered to the stakeholders. ICTO, presently located in the Administration Building and Central Teaching Building with 79 staff members, plays the role of developing and supporting the information technology infrastructure of the University, information systems for the University administration, smart campus management systems, computing facilities for academic teaching and learning. Through 35 years of development, ICTO now has evolved from a small office to a structure that is required to give comprehensive and high quality support to the academic and administrative members of a world-class higher education institution. For more details, please refer to the website http://icto.umac.mo/about-icto/history-and-milestones/. The development of ICTO infrastructure and services could be divided into five phases. In the initial set up phase, the computer services were developed to fulfil the basic needs of the University. ICTO developed all major information application systems for the University administration with the use of Wang/VS minicomputer and COBOL computer language, the data input was done using the Wang terminals and the computing jobs were handled on batch mode basis. 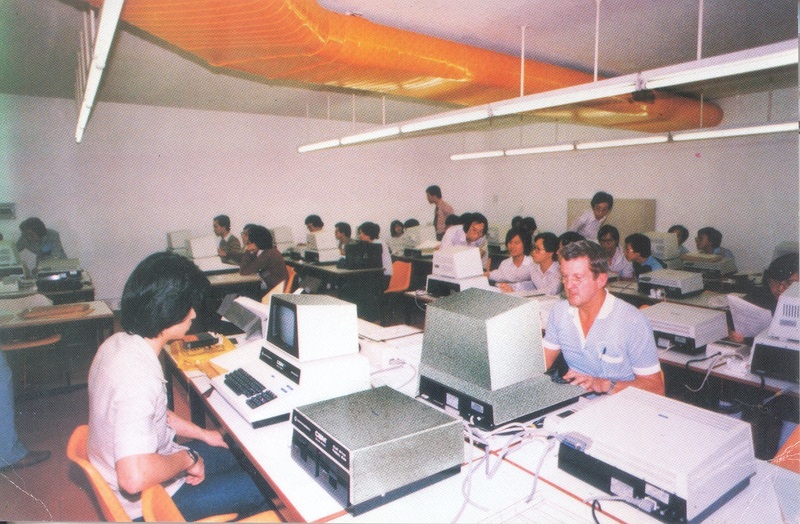 ICTO provided minicomputer systems (NCR systems, Discovery) and some microcomputers (IBM PC-XT and PS/2) for academic teaching. The core IT infrastructure of the University was established in this phase. 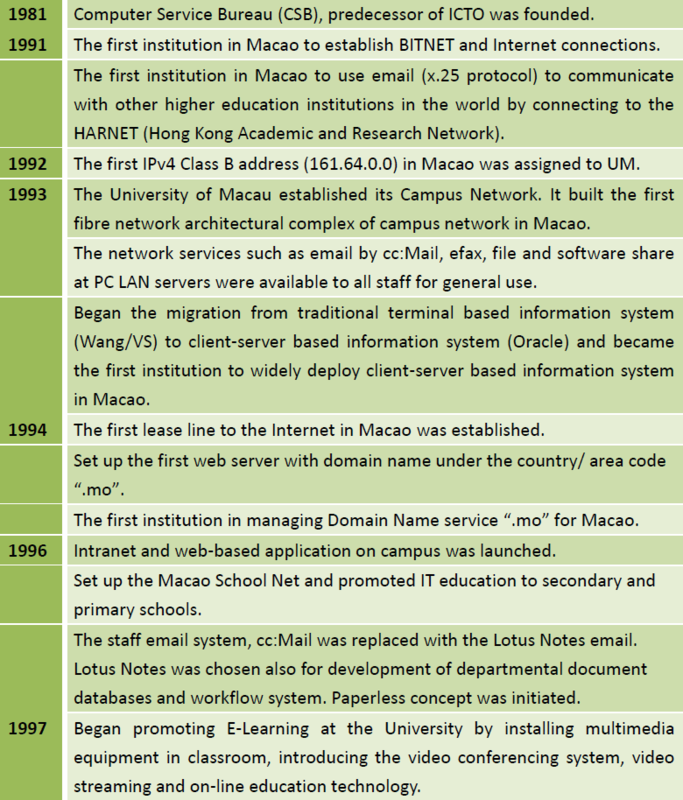 It included the connection to HARNET and the provision of the UNIX systems for academic use in 1991, applied the IPV4 Class B address in 1992, the establishment of the campus network in 1993, the first Internet connection in Macao in 1994, set up of library automation system, provision of the computer rooms running 24 hours a day and 7 days a week, provision of the PC LAN service for the administration and promotion of office automation, migration of traditional terminal based information system to client-server based information system, etc. After the formation of core IT infrastructures and the linking up of all computing facilities, ICTO started to consider how to make use of the information technologies to improve the efficiency and productivity of the University administration as well as the academic teaching quality. ICTO had studied, tested and pilot used various information technologies, such as groupware system, web-based application, electronic workflow technology, video conferencing system, multimedia and on-line education, etc. After testing of the various information technologies for a few years, ICTO introduced the “E-Campus” or “Digital Campus” concept in 2000. The traditional student card and staff card were replaced by the UM Campus Card (Smart Card). Smart card technology was employed for facilities management. With paperless office with the use of electronic workflow technology, UM office was made paperless. Wireless network allowed users to connect to the UM campus network with notebook computers at any point on campus. Academic staff were provided with notebook computers for teaching purpose. Student were encouraged to bring their own notebook computers through promotion of the Student Notebook Ownership Programme. 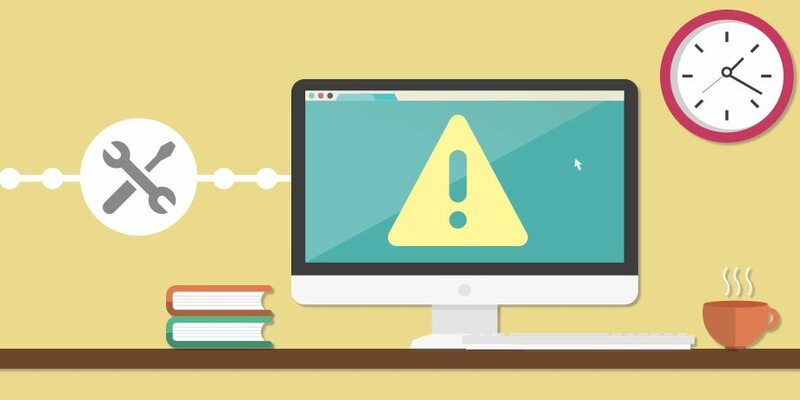 E-learning was adapted for academic teaching. Internal staff IT literacy training; and electronic library service were enhanced. In addition to the support of traditional computer systems, ICTO had extended its technical support services to a larger population of IT users and in more areas of applications. Besides internal IT development, ICTO organized or co-organized IT conferences, workshops and exhibitions for promoting the information technology in the local community, managed Macau Network Information Centre (MONIC) to provide service to the local community and supported standardization activities for the establishment of Chinese domain name. Due to the success of UM’s information technology development, some government departments and institutions (such as CEQV, AMCM, IACM and Kiang Wu Nursing College) had requested ICTO to provide services on information application system development or IT consultation. The year 2009 was an important milestone in ICTO’s history, since the National People’s Congress Standing Committee passed a bill which approved the construction of UM’s new campus on Hengqin Island and authorised Macao SAR to exercise jurisdiction over the new campus site. To ensure a smooth relocation for the new campus, ICTO started to firstly design the ICT infrastructure, set up the testing environment on existing campus for the critical IT systems and secondly carry out the acquisition of various IT equipment and tendering procedures. The university took over the new campus site in 2013. Over 450 ELV rooms (rack rooms), 60,000 network access points, near 500 fibre connections and 14,000 electronic locks were inspected. In addition, two data centres with 200m2 and 300m2 in size, more than 10,000 computer accessories & peripherals, 1932 IP phones, 3,800 wireless access points, 2,300 network switches, 100 servers and 7 data storage systems were set up and tested on this new campus. It is the largest scale of IT infrastructure in Macao. During the campus relocation in 2014, the IT infrastructure was successfully migrated to new campus. It is not only a unique opportunity to have such a big scale of server/campus relocation in Macao, but also a precious and valuable working experience to our team of young and energetic colleagues. In spite of heavy workload on the construction of new campus, a number of new services were introduced in this phase. 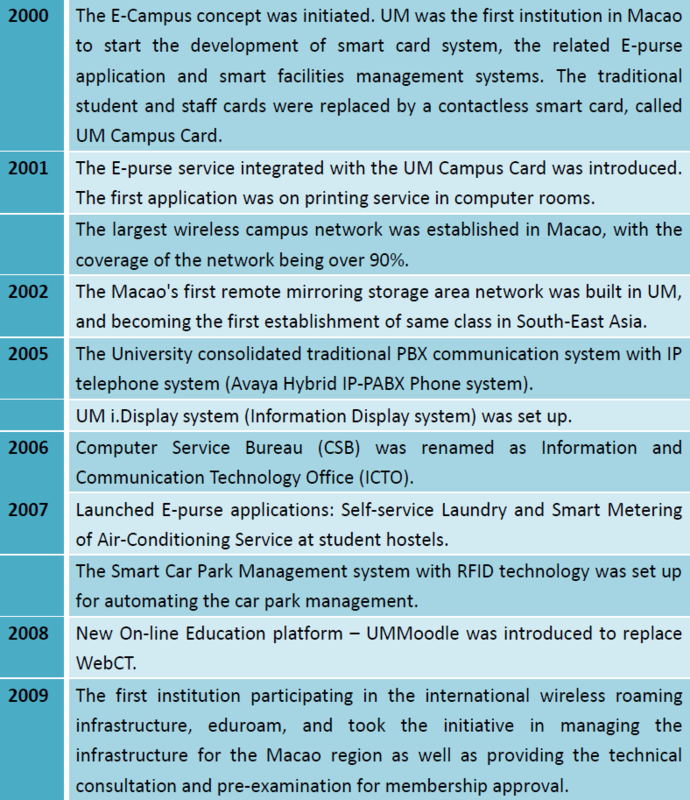 It included the participating in the international wireless roaming infrastructure, eduroam; the connection to the IPv6 Internet in 2009; the implementation of the secure and quick technical support method, Remote Support Service in 2011; the first educational institution web server in Macao supporting IPv6 and the deployment of High Performance Computing Cluster named “Pearl”, the launch of Follow-You printing service in 2012; the establishment of interactive Electronic Campus Map in 2014; the launch of Student Lifelong Email service – UM@Connect, the migration of Lotus Notes email platform to MS Exchange and the migration of Lotus Notes document applications to Microsoft Share Point in 2015. 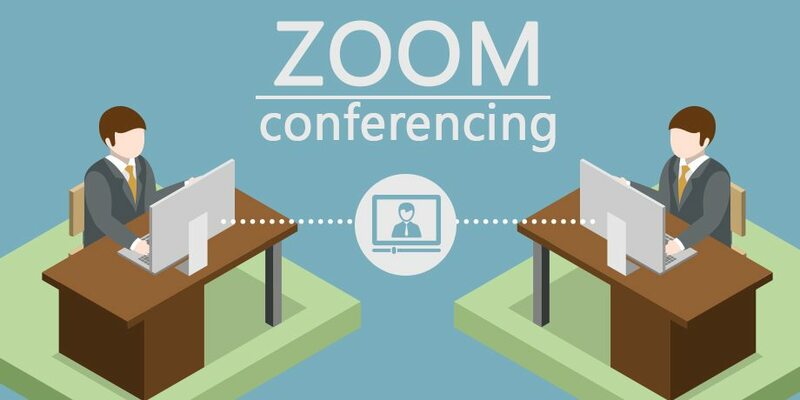 In addition, the MobilePrint service and Zoom Cloud-Based Web Conferencing service were launched in 2016. The achievements of ICTO over the past 35 years are the result of great insight of and support from the senior management of UM, the wise leadership of former and current heads/directors as well as the joint efforts of ICTO staff members. Let us to express our sincere appreciation to people who have contributed to ICTO’s continuous development.